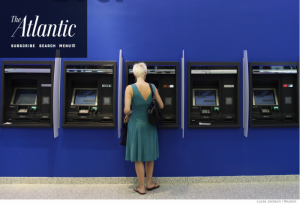 A recent Atlantic article, Life in a Banking Desert, explores the implications of the increasing percentage of households living in communities without access to mainstream banking services. The article cites a March New York Fed study that highlights the decades-long trend of bank branches closing in lower-income communities and communities of color. Similar to convenience stores moving into food deserts and impacting communities’ physical health, alternative financial services providers such as check-cashing stores and payday lenders moving into “banking deserts” keep residents from building long-term financial health.